Editors’ Note: The following is adapted from our forthcoming book, working-titled: For the Winners. What we’re creating with Copiosis is opportunity for all. Not just opportunity, truly unprecedented, first-of-its kind opportunity: Freedom and Wealth For Everyone. First, we’re creating societies that thrive on moneyless economies. No, that’s not a oxymoron. Talk about an economy – let alone a society – that thrives without money. You’ll be met with blank faces. Humanity and money have been together for so long, we can’t conceive what society would look like without it. Common belief suggests no civilization can survive without a thriving economy. Economies can not function without a viable exchange medium. Our almost religious belief in money as the sin qua non of functional economies, brings with it a panoply of problems. Those problems will intensify until we kick existing structural systems to the curb, replacing them with something better, including a better way to reward those who produce value. Eliminating money from civilization is a grave issue. Money is not the root of all evil, but for many reasons, money causes nearly all problems we see today. Eliminate money and virtually all these problems disappear. No endeavor holds more promise. 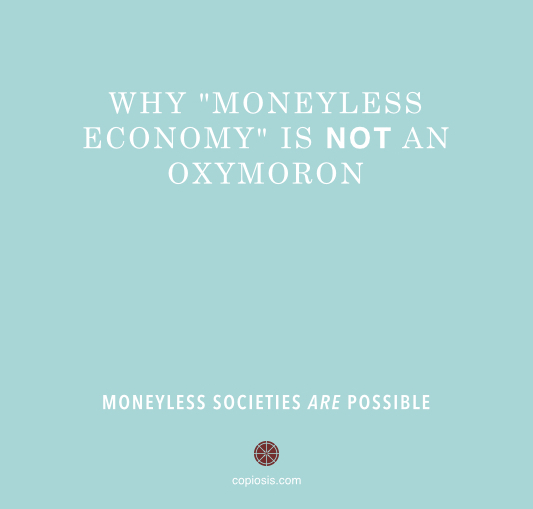 More of us are discovering the theory of how moneyless economies might benefit humanity. What it would look like and how it would function are different matters. Copiosis is answering the what and the how. Without these answers, such societies will remain merely theoretical. How does this equal opportunity, let alone wealth, for everyone? …you will never have to worry about things like retirement, being able to send your kids to college, paying for catastrophic medical problems, working if you don’t want to. …well, I can basically do anything I want. So what do I want? I knew it meant I’d never, ever have to work again unless something went terribly wrong. The only thing I really desire nowadays, is for “self actualization”. How do I leave a legacy in a short life? Being wealthy is less about money and more about what money allows. Wealth = freedom. He wrote a paper a long time ago called “A Theory of Human Motivation.” The paper later became a book “Motivation and Personality”. You may not remember the writings. I’m sure you remember his famous Maslow’s Hierarchy of Needs. To review briefly, Maslow asserted five motivations behind human action. Self-Actualization – creativity, spontaneity, problem solving, acceptance of facts, etc. The five motivations above are written in backwards order. They really look like the pyramid to the right, with step five representing the pinnacle. The others come underneath it. People generally strive to climb the pyramid, the goal being Self-actualization. Some people, most people get to level three or four. Few reach level five. The main thing about being wealthy is your priorities. With wealth, priorities shift up the pyramid. Radically different life experiences result. No, not flying in private jets and screwing the 99 percent. But taking time to completely understand oneself, then achieving those things that add to one’s self-worth, -esteem, and the higher states of being human. This is what Copiosis offers everyone. How? Copiosis replaces money with Net Benefit Reward. Net Benefit Reward is not money. Some of its functions are similar to money in appearance. Yet, Net Benefit Reward is limited in ways money is not. Net Benefit Reward, like all rewards, represents an expression of a society’s gratitude to an individual whose acts benefit society and the planet. This is a critical difference between Net Benefit Reward and money. Any reward is a gift. It is not something the recipient expects in return for something. Typically, rewards are awarded after the fact. Sometimes, the person or organization offering the reward is a third party to the act itself. Recipients of said rewards are usually not expecting such recognition. They are instead performing acts of their own volition for purposes other than receiving the gift of recognition. If you read such accounts, this invariably is the “hero’s” response. It is the Staff Sergeant, the Platoon commander and their chain of command – the Marine’s “society” – that responds to this Marine’s “just doing my job” – his act – by rewarding him with the Nation’s highest honor…after the fact. After all the details are in, often after several months go by. Sometimes it takes years. This is how Net Benefit Reward in Copiosis works too. Producers act. They act because they are passionate about what they are doing. They are doing that thing as an expression of their passion. They do that thing because they can’t think of anything else they’d rather be doing. If they could be doing something else, they’d be doing that. They could be doing it because their passion is to make society better in a way they know how, in the way that fulfills them. They could be doing it because they just love doing that thing and they’d do that thing if society was around or not. A Copiosis society responds to Producers’ “passion expression” by rewarding them. Producers can then use that reward to access certain other rewards. Things that are only accessible….not through reward….but through acts. There is no exchange going on. There are only acts. Society rewards desirable acts by making accessible certain tangible rewards. 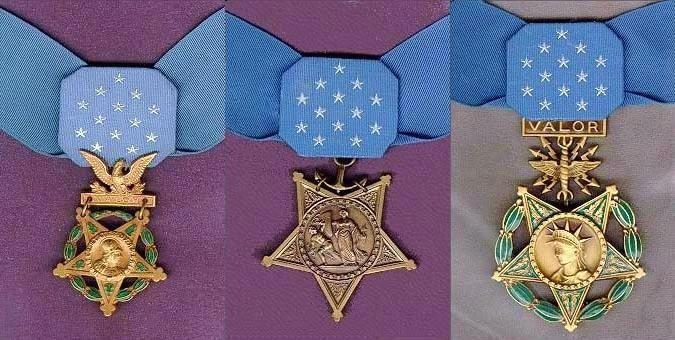 Incidentally, Medal of Honor recipients, once rewarded can use that reward to access other rewards not accessible to others. Net Benefit Reward functions similarly. In a Copiosis economy, “certain rewards” are luxury goods and services. Necessities (food, clothing, shelter, education, healthcare) are provided to all at no cost. Producers who make necessity goods are acting. Action which produces Necessities are rewarded by the Copiosis society with Net Benefit Reward. That is how Consumers receive Necessities at no cost. Is Copiosis akin to that fabled “gift economy” people theoretically talk about? Or is it an exchange economy? It doesn’t really matter. This is how Copiosis works. Shortly after the transition, producers may feel they are owed this reward like an exchange. Such feelings don’t describe how Copiosis works. Copiosis doesn’t “make” people feel this way. That feeling is an artifact of a system where people needed money to buy things they needed to survive. The way they got that money was to earn it (through work). Debt fostered expectation—if money didn’t come, one risked loss. The longer the delay between work performed and money paid, the stronger the expectation. Foiled expectations lead to anger, workers’ rights and labor unions. After all work in the old days was often dangerous, life-threatening and extremely physically demanding. Creditors were unforgiving as well. Fail to pay your debts and you could lose all your possessions, even your children and your wife. This doesn’t happen in Copiosis. Everything you need is provided at no cost to you. Society covers the “cost” as an expression of gratitude (Net Benefit Reward) towards producers. With all Necessities provided, everyone instantly experiences wealth unparalleled. The first two levels of Maslow’s hierarchy – where most people invest their time achieving – are instantly covered. But it doesn’t stop there. People now are free to do whatever they want in pursuit of climbing the pyramid. Freed from earning a living, it’s natural that people will perform acts best-suited to their talents. Now they have time to discover who they are. What lights their fire. Contributing to others and to society then becomes natural. Copiosis creates a functioning economy with no medium of exchange. That same economy overflows with exchange at all levels and in all sectors. No money required. “Eliminate money and virtually all these problems disappear. No endeavor holds more promise.” – Very true, people must understand this statement. However, You cannot create a moneyless economy (MLE) without first eliminating the central bank economy (CBE) that we have now. “Recipients of said rewards are usually not expecting such recognition.” – This is also correct. Then, is there a need for any reward? The concept of reward comes from the CBE. If you remove CBE then the reward concept will also vanish from human mind. People work because of destiny. Galileo will come century after century, because global destiny of the universe brings them here for all of us. His discovery did not affect our society, not even now. The discovery of reincarnation is another such profound contribution. Search million people, you may not find a single person who will prove memory of the previous life. Those who produce such researches do not do it for rewards, even the benefits of society is also not observable. There may be people who will build spaceships to travel to distant galaxy at many times faster than the light speed. Our society must create opportunities for such an enterprise by encouraging a large group of people. In MLE government or individual should be motivated for such activities. Building a Taj Mahal may be another such activity. Thus the present society should be maintained and enhanced to achieve better civilization. But it must be based under MLE. Jacque Fresco has pioneered much of the ideas Copiosis is trying to improve from Jacque’s Venus project, https://www.thevenusproject.com/ . I’m just curious if you explain how we would avoid scarcity and elitism with this type of system. It would appear Copiosis has determined Jacque’s system could use some improvement, and instead doing away with money completely, as Jacque Fresco suggested, that some form of payment system should remain. Can you clarify for me if someone who acculmulates more NBR’s than others will have more possessions, which may cause some form of scarcity to continue? As scarcity has been identified as a cause for corruption, inequality, elitism, war, theft, disputes, and a breakdown in the system, wouldn’t the NBR’s have a similar result, but maybe to a lesser extent than what we see today with money? Can you explain how the individuals handing out NBR’s will not become the new elite who become corrupted with power? It is true that we believe Jacque’s system can use improvement. All is improving though and that includes Copiosis. So we’re not saying our solution is perfect. Like Jacque’s theories, we too believe money needs to go. However, unlike his theories, we offer a real, practical way to actually make money go away. Included in our transition plan (which extends far beyond when Copiosis is the dominant global system) is that our NBR system and the payer organization entirely disappears, leaving humanity completely free of any kind of reward. Copiosis is a process not a destination. NBR, by the way is not a “payment”. It is far different than money and functions nothing like it. So “payments” in Copiosis don’t exists. NBR is a reward which is a far different kind of recognition than “payment” and sets up a different relational dynamic. It (NBR) represents a shift in thinking, which I think is what Jacque advocates too. There is no scarcity on the planet. It’s artificial. Just because someone has more NBR than another and therefore can obtain more than another is a separate issue from “scarcity”. Maybe what you’re referring to is “wealth inequality” as expressed by an unequal number of one person’s possessions compared to another and power advantage that results from that? To fully answer your question, it would be good if you’d be willing to clarify that. Thanks in advance! The cause of corruption, inequality, elitism, war, theft, disputes, and a breakdown in the system is not scarcity. It is the power dynamic resulting from the framework which creates the perception of scarcity. This framework doesn’t exist in Copiosis so neither does scarcity. Corruption will exist in small pockets and in very short time frames (like weeks likely) because of inherent elements in the Copiosis design, including Reputation Accounts and “no cost, but not free”. If you want to know more about these, let me know. In addition to those inherent elements, NBR, because of its nature (not being money) eliminates all the concerns you have about these problems. As for members of the payer organization, this answer we provided on Medium, answer your question about corruption within the payer organization. Please check it out there, then, if you have more questions, let’s chat more! If luxury items can only be obtained with the NBR system, this will restrict access of these items to a privileged few. It will also create a sense of entitlement to a privileged few. I have to admit, RBE does sound like the type of communism everyone has grown to believe is evil. However, communism as we know it has been corrupted by a tiered society which is dependent on money, and an autocratic political system. They also have a serious problem with an underground economy, or black market. Apparently this black market only got worse with the economic reforms which occurred in the 1980’s. First of all, who decides what a luxury item is? Secondly, if a tiered system of haves and have nots is created, this is the form of scarcity I am referring to. Jacque Fresco strongly advocated against this with the monetary system, and I think his point is relevant here. As he said, people steal items which are being withheld from them. If everything is available in abundance, there is no need to steal. When you say, Jacque Fresco himself didn’t know how to bring about a RBE, this is a distortion of what he said. His problem wasn’t with how the society should be organized, but rather of how to get the whole world to adopt such a system. The whole world would need to be on board for it to work, and it is difficult to convince people who are prospering on the present system that it needs to change. This is the reason the USA was so much against communism, and this is the reason they won the cold war. The USSR, which was formed on a flawed monetary system, and a corrupt government, needed to trade with the rest of the world to survive. We all know what the outcome of this cold war was, and we are lucky it didn’t result in an actual world war. However, Russia is now being manipulated from the outside once again, and this is creating renewed tension between these old rivals. Unfortunately, the 1% who are presently controlling all the money, for the most part are responsible for all this chaos. As they say, chaos is cash. Money brings power, and absolute power corrupts absolutely. The issue is, hopefully it won’t take a world catastrophe which humanity can’t recover from to convince the majority of people in this world the present system is doomed to failure. This could be in the form of mass destruction, slavery to debt, martial law, or a combination of these. The factors which are pushing us in this direction are exponential growth of our world population; ever increasing loss of jobs to automation/computers, transfer of jobs to low cost centers, increase in poverty, and ever increasing market crashes; and corruption due to profits made from war, oil, disease, unstable markets, etc. I think it’s great to see an increase in interest for an RBE, and that it is coming from different sources. It means more people are questioning the effectiveness of the present system, and looking for a better way than the corrupt monetary system we have at present. Yet, I think it will be self defeating if we are not careful to avoid a “divide and conquer” from within the same movement in fear people won’t buy into these concepts because they can’t let go of the old system, or with anyone’s ego getting in the way of eliminating corruption altogether. This type of conversion from one system to another by using aspects of the old system in the new system to make it more palatable to the masses has been repeated many times in our history, and this is how good ideas have been distorted in the past. Our eastern religions are a good example of this. The “pagan” lunar celebrations were converted by the church into religious celebrations of the different phases of Jesus’s life. I’m sure this was a deliberate attempt at eliminating the resistance to change due to a fear of the total destruction of the existing “pagan” culture. Did it really help spread the principles which Jesus tried to teach, or did it just help distort the original message? Just look at what Christmas has become. We need to learn from history if we do not want to be doomed to repeat our mistakes. I understand the concern of not being able to motivate people to work when they don’t have to. However, as far as I’m concerned, I would feel bored, unfulfilled, and guilty if I didn’t contribute to society in a positive way. People already volunteer in their communities to get things done which wouldn’t get done otherwise. I’m sure not everyone is like this, but I’m of the opinion when the choice is whether you contribute to the system or it will fall apart, the majority of the world population would decide to contribute. I’m sure Jacque Fresco understood you can’t force people to make this decision because it would never work if you did, and this is the unknown factor of what it will take to convince people it is the right choice. They have to want it for it to work, and it won’t come without a lot of work. Also, you don’t convince them to want the new system by disguising it to look like the old system, especially the part we are trying to get away from. I understand the Copiosus version of an RBE system with the NBR would be better than the present system, but I believe it will help perpetuate some of the same problems we are trying to get away from, corruption, greed, etc. Maybe it would seem like a way to transition ourselves into such a system, but I would be concerned with the direction it may take. Why not just do it right the first time? That would be a novel approach. As Einstein once said, the definition of insanity is doing the same thing over and over again and expecting different results. Your points are good ones and I applaud your support of Jacque’s ideas. They are worthy of endorsement. There are some aspects of what Jacque has said though, that deserve scrutiny. That is not a critique, it is just how things are because Jacque doesn’t have all the answers. Neither do I. However, I do have some which Jacque appears not to have. Which is why I think Copiosis offers a compelling niche solution. It is critical when looking at Copiosis to know that Copiosis is a transition pathway. It can be an ultimate solution, but I don’t see it as such. It’s ultimately up to what society decides after Copiosis is implemented as to what happens then: Do we move all the way to an RBE or some other model? is the question to be answered by future generations. We can’t answer that question for them. Knowing that Copiosis is a transition pathway addresses your concern about restricting luxuries. It is inaccurate (if you’re paraphrasing Jacque correctly) that “people steal items which are being withheld from them”. If that were the case, how on earth are there so many things not being stolen? Yes, stealing does happen. Stealing of luxuries does happen too. Not on a mass scale though. So the majority of people are just fine living with some products being unaccessible. Particularly if they are used/seen by people (as they often are) as aspirational material goals, like: when I have more money I’m going to buy that car I can’t afford right now. Temporarily unaccessible luxuries can be inspirational/aspirational goals. That’s not a bad thing. if those things are being withheld from them. Note that most theft of luxuries are being committed by people who are in financial desperation. Particularly in the case where money is being stolen. So I don’t think it’s a foregone conclusion that restricting access to the luxuries will create entitlement or stealing. BTW, in Copiosis, everyone has the resources they need to accumulate luxuries. No one is more privileged than another, except in a temporal sense: Some may have gained skills and knowledge before another, enabling those “somes” the ability to generate NBR sooner or in greater quantities. But, (1) since all necessities are provided to all at no cost including education and (2) since the amount of NBR is infinite, there is no inequality you (I think) are presuming in luxury accumulation/access. Also, everyone has a passion. Everyone who exercises that passion in some way benefits either mankind or the planet. This is a rabbit-hole subject related to consciousness and how physical matter interacts with human consciousness. So we don’t need to go there. I agree with you: communism in its current form has essentially ruined communism for most western peoples. You’re right too, money and power (a lack of technological advancement) has helped make communism seem unpalatable. However, the RBE’s idea of a single group deciding how resources are used is problematic because, aside from it sounding like communism as it looks today, the concept runs afoul of how things naturally come to be. That is another rabbit-hole topic I’ll avoid for now. Who decides what a luxury item is? The person making the thing decides. No one tells anyone how do to or what to do. No one restricts anyone from doing anything. There is no scarcity in the way you describe. Just because some people have the NBR “now” to obtain something, doesn’t mean in a future “now” those who didn’t have the necessary NBR before still don’t have enough. Also, just because someone can obtain something now, doesn’t mean the thing obtained won’t be available in the later now. “Haves and have nots” is not a problem in Copiosis. The only thing keeping you from having enough NBR to have something another already has is your ability to put your passion into action to benefit others and the planet. And since everything you need to do that is available to you at no cost, there’s nothing stopping you or anyone else. What creates haves and have nots today is money, what is accesses and major barriers between money and getting said money. Money doesn’t exist in Copiosis. Neither do any of the barriers preventing someone from accessing NBR. So scarcity of the kind you refer to doesn’t exist. When you say, Jacque Fresco himself didn’t know how to bring about a RBE, this is a distortion of what he said. His problem wasn’t with how the society should be organized, but rather of how to get the whole world to adopt such a system. I didn’t say he didn’t know HOW TO ORGANIZE society, I said he didn’t know how to get from today to the society he envisioned. So you’re right when you wrote “His problem wasn’t with how the society should be organized, but rather of how to get the whole world to adopt such a system.” and that’s what I was referring to. He doesn’t know how to bring it about. So I think we agree on this point. The whole world would need to be on board for it to work, and it is difficult to convince people who are prospering on the present system that it needs to change. This is the big blind spot (and I think it’s fair to make the next claim) 99 percent of RBE-ers have: understanding that it’s not difficult at all to convince people who are currently prospering. It is also not accurate to say you have to convince the whole world to make it work. This is also the big difference between Copiosis as an implementation organization, and TZM as an activist one. We know how to do what you claim to be difficult. It’s not difficult. This is the reason the USA was so much against communism, and this is the reason they won the cold war. The USSR, which was formed on a flawed monetary system, and a corrupt government, needed to trade with the rest of the world to survive. We all know what the outcome of this cold war was, and we are lucky it didn’t result in an actual world war. However, Russia is now being manipulated from the outside once again, and this is creating renewed tension between these old rivals. Unfortunately, the 1% who are presently controlling all the money, for the most part are responsible for all this chaos. As they say, chaos is cash. Money brings power, and absolute power corrupts absolutely. The issue is, hopefully it won’t take a world catastrophe which humanity can’t recover from to convince the majority of people in this world the present system is doomed to failure. This could be in the form of mass destruction, slavery to debt, martial law, or a combination of these. The factors which are pushing us in this direction are exponential growth of our world population; ever increasing loss of jobs to automation/computers, transfer of jobs to low cost centers, increase in poverty, and ever increasing market crashes; and corruption due to profits made from war, oil, disease, unstable markets, etc. I don’t agree with anything you’ve written above. You’ll get a lot of agreement from many people, but my perspective is different. The political statements you’re making about Russia are beside the point (of Copiosis). But I understand them as you have written them. I have no quarrel with your perspective, even though I don’t agree. I think it’s great to see an increase in interest for an RBE, and that it is coming from different sources. It means more people are questioning the effectiveness of the present system, and looking for a better way than the corrupt monetary system we have at present. More people may be looking at the RBE concept. That is a good thing. What I think is really happening though is more people are looking for an alternative to the status quo. That is different from looking at the RBE though. Both could be happening. It’s really hard to know. I appreciate your concerns because I’ve heard them often, often from those who haven’t really tried to understand, but instead have tried to find flaws in Copiosis. It’s a normal approach I’d say. Your first point about divide and conquer within the same movement is another common refrain I hear. Unfortunately (for those who feel this is a problem) nature works exactly this way. There is massive cooperation in nature. But fruit trees, for example, don’t try to become pine trees and leopards don’t become elephants. There is strength in diversity and that includes strength of diversity in both ideas and approaches. I’m not sure why people make the argument for unity. I can only guess that they think there is strength in that, because they’ve been told this. Or perhaps it’s because they don’t feel empowered as a single individual. I believe the opposite: One person is more powerful than millions under the right circumstances. This is what I advocate within Copiosis (the organization). Copiosis is not trying to incorporate elements of the old system into a new one. Nor is it trying to take ideas from the RBE and make a new thing. It is completely different from both. We looked at capitalism and debt-based financial systems from a re-engineering perspective and designed something new that had none of the current system’s flaws. During this process, we at Copiosis knew nothing about TZM, TVP or “RBE”. So there was no borrowing from it. A (valid) argument goes “people can’t embrace the RBE because it’s too foreign. But they can embrace Copiosis because it has elements that are familiar. Reward for output is an example.” While you (and I) are intrinsically motivated, the facts are that a LOT of people have been trained to be extrinsically motivated. It’s not about boredom from being idle, it’s about these people expecting to be rewarded for their output. Again, Copiosis is both a full-blown idea that can do nearly everything the RBE does, AND a transition pathway TOWARDS the RBE. Copiosis would not fall apart if some number didn’t participate. Everyone is free. “Free” MUST include the freedom to do nothing. If the system, whatever kind it is, falls apart if people don’t prop it up, then you have a flawed system and you don’t have freedom. What is the right thing? The RBE? I don’t think it is the “right” thing at this time. And it may never be. Because it has inherent problems I don’t need to go into right now. I understand too your concerns about “the direction [Copiosis] might take.” Again, those who haven’t thoroughly understood Copiosis have similar concerns. But an understanding of how Copiosis works makes many of those concerns go away. Those remaining can be solved from within Copiosis, as every improvement in the system is an NBR-worthy event. Copiosis makes greed virtuous again. Greed is a very powerful motivator as we have seen. Why not channel that greed in ways that make humanity and the planet better off Instead of trying to do away with it? The virtue Greed has been made evil because of the context within which greed is practiced. That’s what Copiosis does, it returns human greed – a natural aspect of what it is to be human – into a virtue again by creating an entirely new context within which greed becomes virtuous. I could not agree more with your perspective on money, the ‘grind’ is real and apparently never ending. I do not get fulfillment from my day job and have to pursue a night job to help contribute more financially. The quality of modern individual life is dictated by money and the pursuit of material things. Pair this with the encouragement of instant gratification, the glorification of ‘me’ and the readily available over saturation and it almost appears to be intentional. We, as a people, have allowed and perpetuated this horrific cycle. We wage wars, draw lines in the sand and spend our lives submerged…what if this energy were directed in other areas, what if the daily pursuit was one of self actualization and not the struggle that most humans experience? How can we be so savvy and yet so ignorant? You put it even better than I did. Thank you. The interesting thing about your description is I think people, generally, believe this is the good life. And for some of those people, it is the good life. That’s what makes having them see a better alternative can be tough. How can we be so savvy and yet so ignorant? Fantastic question. And I’m right there with you imagining what life would be like if the daily pursuit of EVERYONE was one of self actualization…. That’s what keeps me going. Thanks so much for your comment. What if no one is “passionate” about producing one of the goods that society desperately needs? So I get “NBRs” for producing a good or for doing something for society. Who issues NBRs? How many do I get for growing an apple tree? How many do I get for picking an apple? And if I get MORE NBRs for an apple tree then why would anyone build a chair? There will be people who are passionate about everything. I posted a blog recently about a person who feels it is her calling to draw blood for goodness sakes! I found that really strange honestly, but it also convinced me that there will be people who want to do the work society really needs. Or…we’ll find a way to automate that work. In the meantime, those doing work they don’t like, or that no one likes to do AND that is desperately needed, guess what? That work once done produces a crap-ton of net benefit, right? So the people who do that work will be rewarded highly for such work. Your second question: the answer is the payer organization via the NBR algorithm. It’s really an automatic process once the variables are understood. So I guess the real answer is the software does the issuing. Third question: it depends on how the variables are populated. How many people want the chair? How many people are making chairs? What kind of material is the chair made of and where does it come from and how? Are other chair makers producing chairs the same way? How happy are people who use your chair? What are the objective benefits of using your chair? How does your chair benefit the environment? Society? Humanity? All these questions need to be answered before we know how much NBR you get for building a chair. The NBR algorithm document (available in our Facebook social group) explains all this. Sixth question: this is a good question. Unless the chair is spectacular in its design, performs many other functions than seating someone, is made of renewable resources and comes with a cradle- to-cradle supply chain custody, the Apple grower will be rewarded more. Does that seem obvious? I hope so. Now, why would someone build a chair? Today there are people who build chairs knowing full well there are others earning far more doing other things. But chair makers don’t quit making chairs. Why would they in Copiosis? Presuming of course chair makers are choosing that avocation because it aligns with their passion, it seems to me a chair maker would do it as an expression of who they are. And so they would make outstanding chairs regardless as to how much NBR they merit. But that’s the thing: when you’re focused on making something great, you tend to reap rewards. So too is the case in Copiosis. Hope that helps. Sorry about any typos. I’m typing on my phone. I’d love so know what commonalities you see between Copiosis and Ubuntu. Is there a link you can share where we can learn more? I found this http://www.ubuntuplanet.org but I can’t find details on a transition plan or how Ubuntu works. I’d love to hear more. Would you mind sharing some more information with me? We’re not sure what you mean by your question. Do you mean the transition process or how decisions are made after the transition? We have lots of documentation about this in the blog on this, but if you clarify your question a bit, we could offer a better answer. Hey Justine, clothing will be provided the same way they are today – in factories – but in much cleaner, much more environmentally friendly ones. The people working there will be working not because they need to, but because making clothes is their passion. No togas (unless you want to), but actually very advanced clothing that does way more than clothe you. Happy that you are visiting. Ask anything you want. Welcome. Reads well, especially the first few paragraphs, but needs a little more specifics. Also, there’s a small typo “psychological.” Great work! Will follow. Hi. On first glance, I notice that your text needs proof-reading in order to ensure that the information you are communicating is clear and accurate (for example, “Pshychological”, should be ‘Physiological’; there are others). Attention to detail is an essential component of the skillset necessary to convey a clear and coherent message. The effectiveness, and therefore the resilience of information, lies in its clarity and accuracy. It seems to me that you have an interesting idea, and I will look at it in more detail, but I would like to emphasize that if it truly has the potential to contrubute to the realization of a better world for all then I’m sure you’ll agree that its presentation is deserving of such attention. It does Alex. Agreeing with you, allow me to offer a contrary opinion. Had I waited to get an editor/proofreader prior to getting started, one who would be willing to do the work for free, I likely would have been delayed. Had I waited for all the things that remain missing, in both the organization and the innovation, then we likely would not be where we are now. Where I come from (the startup world) there’s a saying: if you’re not embarrassed by your first shipped product, you’ve waited too late to release it. I subscribe to this belief. Thankfully as a result of the rapid launch and despite all kinds of embarrassing things, we have enjoyed growth, earned credibility, as evidenced by the large and growing email list, team (which now includes an editor contributing his time) and media interest, all of which appear to substantiate the truth of the startup approach. Again, I agree with you. But I’m not willing to let the good enough be the enemy of the perfect – apologies if I got that saying wrong :-). This innovation is too important to delay it because we’re doing something wrong in the way we present it. We’ll get better as we go! Feel free to help us make it better! Welcome Shannon. Hope to see you at the event. Please tell your friends! It’s going to be an amazing evening.